About Us - by Frame Minnesota, Local Frame Shop and Custom Framing Service. Tami has been the owner of Frame Minnesota for over 20 years in its Eagan location. She has worked with thousands of customers on their projects—from fine art to treasured photographs to golf course flags to diplomas. 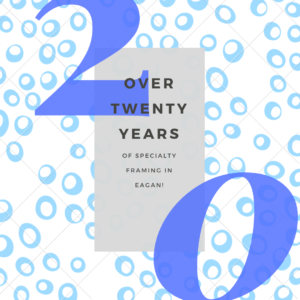 Tami has framed projects for homes, offices and businesses—and with her expertise she can help you determine the best frame and mat combination for your art and memorabilia. By working with Tami, you also support a local business—and keep your money in your local community, where Tami has built her business for over two decades. A locally owned and operated frame store, Frame Minnesota in Eagan has been in business for more than 20 years, providing great work at even better prices for Eagan, and surrounding communities. Whether you need a quick mat cut, a couple of pictures framed or a comprehensive artwork plan for your office or business, Frame Minnesota can help! We are here to guide you every step of the way! At Frame Minnesota, our motto is: You dream it: we can frame it. Come experience our expertise.